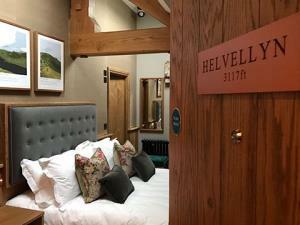 The Queens Head015394 32404work InnLocated 4 miles from Ambleside and Windermere and nestled on the side of the fells which overlook the Troutbeck Valley stands The Queens Head, a 17th century coaching inn. The Queens Head sometimes limits bookings to 2 or more days. Bowfell sometimes limits bookings to 2 or more days. Esk Pike sometimes limits bookings to 2 or more days. Great End sometimes limits bookings to 2 or more days. Great Gable sometimes limits bookings to 2 or more days. Friendly, warm. Lovely stay. Absolute value for money. So, whether stopping by for a pint of one of Robinsons award-winning cask ales, enjoying some wholesome home-cooked food or staying the night, you are always guaranteed to receive a warm Lakeland welcome when visiting the Queens Head. Dogs are allowed in all rooms except Great End, Great Gable, Catstye Cam and Nethermost. If you wish to bring your four-legged friend with you throughout your stay please select from Scafell Pike, Skiddaw, Bowfell, Pillar, Esk Pike or Helvellyn and ensure you select the £10 dog supplement at the payment screen and the number of nights - Please do not bring a dog if you do not book into one of these rooms as our other rooms are not suitable for animals. Please note: we charge £10 per night for your dog and allow only one dog per room, further information available. We can add a 3rd bed to Skiddaw, Great End or Pillar for ?25 per night including breakfast. If you require a third bed, simply select 3 adults and this price will be automatically added to your booking. 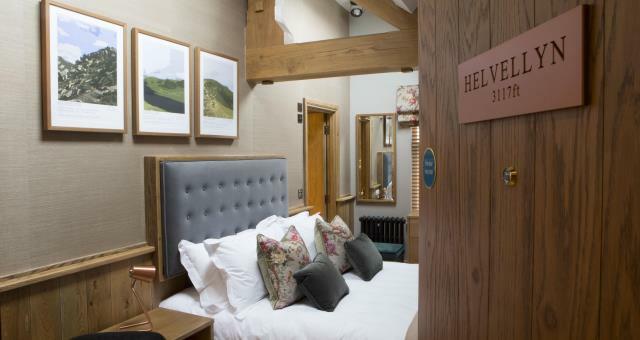 Please note: Helvellyn is situated above our working kitchen and extraction which operates from 9 am– 10pm daily. We have done all we can to minimise all disturbance however, at times, some noise can be heard during operating hours. We have reflected this in our price. Children welcome from any age. From the south, M6 jct 36, follow the A590 which becomes A591 to Windermere, staying on this road towards Ambleside for a mile. At the mini roundabout just past Windermere, turn right on A592 for Troutbeck. The Queen's Head is on the left 0.75 mile past the village church. From the North: M6 jct 40, take the A66 towards Keswick. At the first roundabout turn left on to A592 which runs along the side of Ullswater and then over Kirkstone Pass to Troutbeck. The Queen's Head is on the right.